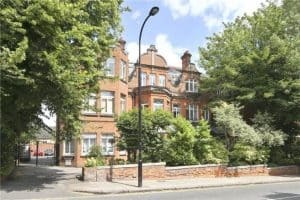 As you approach this Hampstead flat rental it features a period charming brick façade you can’t help but feel enmeshed in the entire feeling of Hampstead Village proper. Located in the heart of Hampstead on Fitzjohns Avenue, this two bedroom, one bathroom upper flat is located along the brick wall lined Flask Walk. The ornate ironwork on the buildings front catches the eye as you look up into a wall of windows that affront this entire Hampstead flat. Upon entry, you take in all the bright natural light that streams in from the wall of windows that overlook the area’s greenery on the tree-lined street. The flat offers hardwood flooring throughout and a clean and good sized black and white tiled kitchen. Bedrooms are modest but so is the price for this well located Hampstead Village proper property. You can enjoy walking your children to school with four schools within a few block radius’s. Paradise; Greek fare from Retsina, Jin Kichi Japanese, Hidden Treasure and Mimmo La Bufala offering Italian, and British modern food from Bradleys. Just at the end of this Hampstead flat rental’s street is the famed 18th-century pub The Holly Bush, and the equally well-known gastropub the Freemason’s Arms. The Garden Gate and the Flask have updated pubs along the flask walk that offer outdoor seating and The Stag is an upscale Victorian pub that offers a roof terrace. Duke of Hamilton is a 300-year-old pub with a basement theatre and for a traditional Irish pub visit McGowans. You could never find a better location of this Hampstead flat when it comes to the convenience of commuting. You are just a couple blocks from four rail stations Finchley Road & Frognal, West Hampstead, West Hampstead Thameslink, and Hampstead Heath. Tube stations are equally close with Hampstead Station being just north, West Hampstead just west, Finchley Road and Swiss Cottage south, and Belsize Park being just south-east.